Melissa and I enjoy going to lunch. We enjoy trying new places. We feel that we are able to be pretty good critics- because we are both pretty good cooks and we both REALLY enjoy good food. 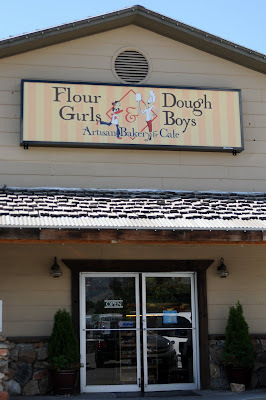 For lunch we went to Flour Girl and Dough Boy. It was really good and we will go back. 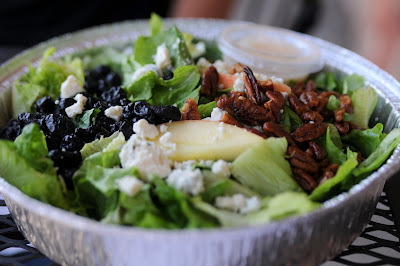 We both had the "Blueberry Apple Salad" and I had it with almonds instead of the pecans and the "Creamy Tomato Basil Soup." Both were wonderful. 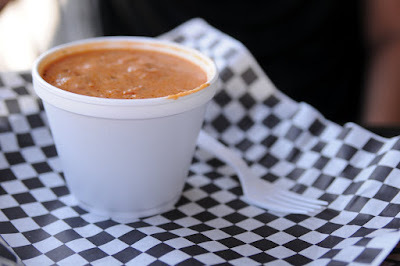 In fact, the soup is probably the best tomato basil soup I've had. It's very chunky with fresh tomatoes. As for the treats- we had the molasses cookie, chocolate chip shortbread cookie, cream cheese brownie and the pumpkin chocolate chip bar. The cookies were only so-so. Melissa's malaskas are much better but the chocolate chip shortbread was really pretty good. The cream cheese brownie, Melissa liked it, it was a little too dark and rich for me and we both though it could have used more cream cheese frosting. The best treat was the pumpkin bar, even my girls liked my left overs. Definitely go and check it out. You'll be glad you did.